As Hurricane Florence was bearing in on the East Coast, Al Gore on Sept. 14 asserted that two major storms from the Atlantic and Pacific oceans had, until last week, never made landfall at the same time. Gore was referring to Florence, which struck North Carolina on Sept. 14, and Super Typhoon Mangkhut, which hit the Philippines on Sept. 15. 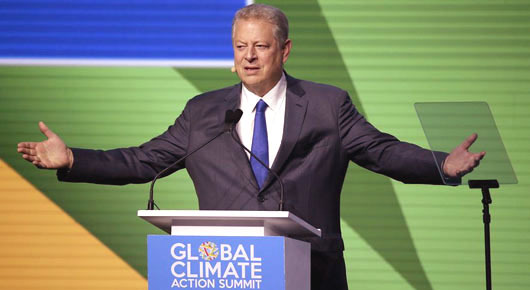 “This is the first time in history that two major storms are making landfall from the Atlantic and the Pacific simultaneously,” Gore told the Global Climate Action Summit in San Francisco. Scientists did a quick fact check on the former vice president. “Al Gore just (fraudulently) claimed without any evidence that we’ve never had hurricanes in both the Atlantic and Pacific making landfall at the same time,” tweeted meteorologist Ryan Maue, an adjunct scholar at the Cato Institute. The NBC report cited Colorado State University meteorologist Phil Klotzbach, who said the development of major storms in the Pacific and Atlantic at the same time was uncommon but made no note of the event being unprecedented.